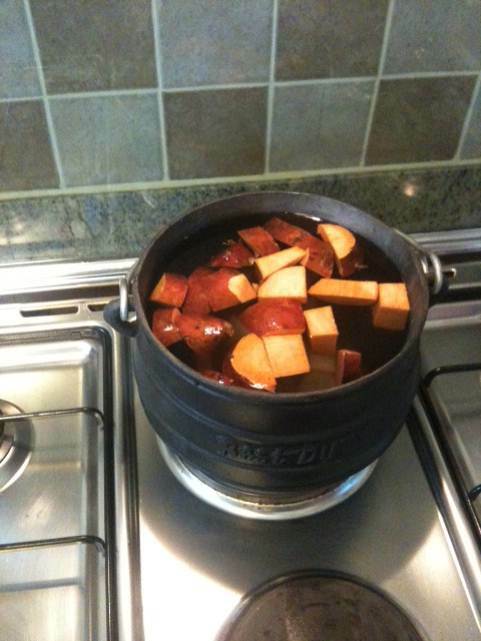 Preparing the potjie pot | What a Potjie! ← The “olds” have arrived.. Preparing the new potjie pot. We have put it on the stove and added some sweet potatoes and will add 100ml of salt so a bit of combination of points 1 and 3. Method 1. Scour the inside of the pot thoroughly using sandpaper. Wash with warm soapy water, rinse, dry, and then grease both the inside and outside with pork fat. Fill the pot to the brim with un-wanted pork, e.g. trotters, but be sure it contains fat, and leftover vegetables such as potatoes, and/or vegetable peels. Fill to the brim with water, place the lid on tightly and cook over a low fire (or gas burner) for three to four hours, or longer, topping up with water so it is always full. Once cooled, discard the food, wash with dishwashing liquid and water and rinse well. Then rub the inside, which will be smooth, and the lid with cooking oil and store. Method 2.. Simple seasoning involves applying a coating of cooking oil and salt to the surface of the cast iron pot and heating it in a hot oven for several minutes. After cooling, the oil and salt should be wiped out with a clean paper towel or kitchen cloth. This seasoning process forms a natural nonstick coating and fills in any crevices formed during the casting process. Method 3. Fill the pot with water and about 100 ml of salt. Bring the water to the boil, and then simmer for about three hours (over a gas burner if you have one as it’s easier to control the heat). Discard the water and rinse and dry the pot. Rub the pot generously with oil and salt. Then heat the pot once again until very hot. Allow the pot to cool and rinse well. To store the pot, rub the inside with oil and stuff a newspaper or paper towelling in it to absorb moisture and prevent rust, and keep it in a dry place. Method 4. Some people like to make a wood fire in a new pot and burn it for a couple of hours. 3-4 hours not enough. Did the vegetables and salt and oil trick and still not clean – going round 2 on the veggies this time for 12 hours!